Buttery pastry scented with cinnamon and orange zest and filled with cranberry sauce. A perfect wintertime morning treat! Combine the warm milk and yeast and stir slightly to combine. Let sit for 5-10 minutes. Meanwhile, combine the flour, sugar and salt, cinnamon, and orange zest in a large bowl. Add the butter and cut it into the dry ingredients with a pastry blender until the butter is the size of small peas. Whisk together the yeast mixture, egg, and egg yolk and add all at once to the flour mixture. Stir with a wooden spoon just until it forms a sticky dough. Do not knead. Cover with plastic wrap and chill for at least 2 hours and up to 1 day. Dump the chilled dough onto a generously floured surface and roll it into a large rectangle about 15 inches wide. Fold the dough in thirds like you would a business letter, the flip over so the seam side is down and short end is facing you. Add more flour as needed to prevent sticking. Repeat the rolling and folding for a total of 4 times. Fold the dough in thirds and cover with plastic wrap. Chill for at least 30 minutes and up to 3 days, or freeze for up to 1 month. On a generously floured surface, cut the danish dough in half. Wrap half of the dough in plastic and store for another use (see Notes). Roll other half of the dough out into a rectangle 10x12 inches. Cut into 8 equal strips lengthwise. Hold one end of a strip of dough in one hand and use your other hand to twist the dough several turns for each strip. Set the strip down on your work surface and roll it up around itself (it should look like a snail shell) and tuck the end under. Transfer to a parchment lined sheet pan. Repeat with remaining strips of dough, spacing 3-4 inches between each danish. Cover loosely with plastic wrap and let rise for about 30 minutes until puffed. Meanwhile, preheat oven to 350°F. Whisk together the egg and water to make an egg wash and brush onto the danishes. Use your finger to press the center of each danish in and spoon a heaping tablespoon of cranberry into the well. Bake until danishes are golden brown, 15- 17 minutes. Let cool on the pan for about 10-15 minutes. Whisk together the powdered sugar and orange juice. Add just enough milk or cream to create a thick but pourable glaze. Drizzle over cooled danishes (it's okay if they're still a little warm). Let glaze set for a few minutes, then serve immediately. Danishes are best the day they are baked but may be stored at room temperature for up to 2 days. 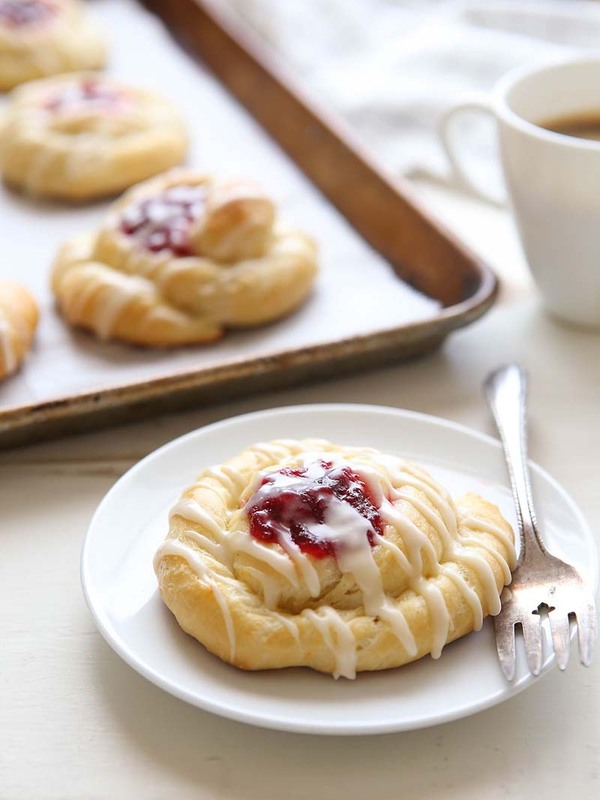 This recipe makes enough danish dough for a double batch (16 total danishes). If you only wish to make 8 as instructed here, store the rest of the dough wrapped in the fridge for up to 3 days or (double-wrapped) in the freezer for up to 1 month. Let thaw before using. You will have leftover cranberry filling. Store in the fridge for up to 1 month. How to make-ahead: Prepare dough the night before and shape into twisted rounds. Cover with plastic wrap and store in the fridge overnight. The next morning, let them come to room temperature 1 hour before baking. Interesting…not like the traditional dough where you have to lock in sheet of butter then do the folds. Can’t wait to try this technique, seems like a real time-saver! I’d like to bake these ahead and freeze them, then thaw Christmas morning to serve. Are they still wonderful after freezing? I think it would be ok to freeze the Danishes (I would wait to add the icing until you are ready to serve). After they have cooled completely, wrap them in plastic wrap and then foil. Let them thaw overnight in the refrigerator, then wrap in foil to warm them and drizzle the icing before serving. Snap a picture when you make them, we’d love to see how they turn out! You can share it on facebook or instagram (#redstaryeast / @redstaryeast). Thanks for info – I’ll let you know how they come out!